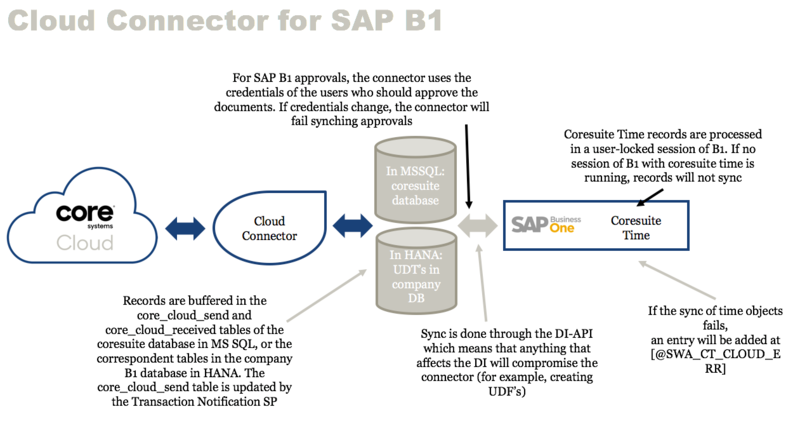 The SAP B1 Cloud Connector allows you to use the data contained in your SAP Business One (SAP B1) database in SAP Field Service Management applications. This document will guide you through the prerequisites required to perform an integration between the two systems, and the process of downloading, installing, and configuring an integration between SAP B1 and SAP. Attention: In accordance with SAP Note 896891, the SAP B1 Cloud Connector cannot process anything that is updated with direct SQL queries. Attention: The SAP B1 Cloud Connector is currently still using a legacy authentication mechanism. You will therefor need to login to the Admin and enable the “Legacy Authentication Log-In Supported” account setting. You must have Coresuite Time installed. In order to complete the installation, you must have SAP Business One Super User privileges. If you are integrating using an SAP HANA database, you must have Catalog Read privileges. Note: It is recommended that you install the SAP Cloud Connector on an SAP (SQL) server. Next, you will download the cloud connector. After successfully, downloading the connector, you can then install it using the installation wizard. Once the connector has been installed, you will then define the numbering sytem used for Business Partners in the SAP applications. These actions are completed in SAP B1. When everything has successfully been mapped, you can then synchronize the data, bringing the data contained in your SAP B1 database into the SAP Cloud for use in the Field Service Management application. After creating a trial account, you can then download the SAP B1 Cloud Connector. 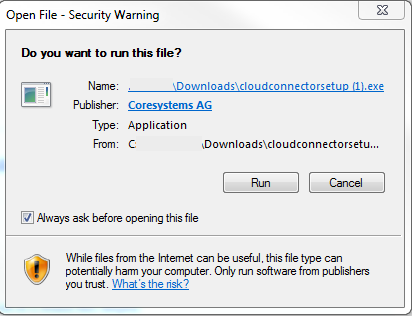 After downloading the SAP B1 Cloud Connector, open the executable file and run it as Administrator. SAP Version The current version of SAP Business One you are using. This information is displayed automatically. Environment Type Radio button. The type of SAP Busines One environment you are using. Options include On Premise or On Demand. SAP Server Name Dropdown. Here you will select the name of the SAP Server to integrate with SAP Field Service Management. SAP User Text entry field. Here you will enter the name of the SAP user. SAP Password Here you will enter the password associated with the SAP user and server. Attention: If you are integrating with SAP using a SAP HANA database, you must have Catalog Read privileges. Catalog Read privileges authorizes users to have unfiltered read-only access to all system views. Generally, the content of these views is filtered based on the privileges of the accessing user. Client The name of the client server. Status The current connection status of the client server. Action Options include Connect or Configure. Click Connect on the client server you would like to connect to SAP. You will then be prompted to enter your SAP Super User username and password information. When you have entered this information, click the OK option below. Attention: The following steps will need to be completed for both the Business Partner - Supplier and Business Partner - Customer objects. Navigate to Administration > System Initialization > Document Numbering in SAP Business One. Double-click on the box beside Business Partner - Customer row. The application will then display a new window for defining the series used for business partners. Right-click and select the Add Row option. Name The name of the number definition (example: “automatic”). First Nr. Required. Number. The first number in the series. Next Nr. Required. Number. The next number in the series. Used to determine if series is ascending or descending in order. Last Nr. Required. Number. The final number in the series. Prefix Optional. String. If applicable, the numbering prefix (example: customer-001). Suffix Optional. String. If applicable, the numbering suffix (example: 0001-customer). Group Optional. Dropdown. If applicable, the group to which the numbering definition is associated. Number of Digits Required. Based on the entry in the Last Nr. field (example: 1000 in Last Nr. would equal 4 digits). After completing all required fields, select the Update option. The application will then apply the settings you’ve created. From the Document Numbering window, select the Busines Partner - Customer option again. Click the entry you previously created (example: automatic), and select the Set as Standard option below. When you have selected an option, click the Update button. The use of native SAP ‘document numbering’ to create BP codes is a requirement In SAP B1 HANA. This is configured at Administration > System Initialization > Document Numbering. You have the choice to use the native SAP ‘document numbering’ to create BP codes or use a SAP system query. Note: Efforts, Expenses, Materials and Mileage only sync back to SAP Business One if Coresuite Time is installed and running. Send Queue Here you can see how many objects are in the queue awaiting transmission. Last Read Access Time Here you can see when the cloud/device was accessed last. Last Transfer Time Here you can see when was the last time that there was an exchange between the cloud/the device. Configure Choose Configure to add or change data. View Log Choose View Log to display the latest entries. Select the SQL server name and the SQL server type from the drop-down lists. Then choose Test to make sure that the connection works. If this is the case, select Next to continue. A list of available SAP Business One clients appears. Connect to the relevant client(s) and choose Next. Enter the user account and the password for the SAP cloud account that you registered. Note: The time to synchronize will depend on the size of your SAP Business One database. It is recommended to review the database size before synchronizing this data. Queue This field will show any data objects (records from the SAP B1 database) that are awaiting synchronization. Last Read Access Time DD-MM-YYY MM:HH. The last time the connection was modified. Last Transfer Time DD-MM-YYY MM:HH. The time of the last data transfer between your SAP account and your SAP B1 database. When you create a business partner in SAP, you can define the code associated with the business partner record. In order to create a business partner code using the Field Service Mobile application, you must apply a template query. After you connect to the cloud, this template query will be added to your SAP database. This template query will then create the code for each business partner created on a mobile device, and can be modified as needed.